James Rubinowitz is a personal injury attorney who is devoted to helping our clients obtain justice after suffering catastrophic injury. Mr. Rubinowitz handles all types of cases, including those involving motor vehicle crashes, premises liability, labor law, construction injuries, medical mal practice, product liability, and wrongful death. He is involved in all stages of our clients’ litigation and is passionate about making sure our clients receive full and fair compensation for their injuries. James has assisted in numerous cases that have resulted in large verdicts and settlements, including one that resulted in a $71 million verdict for a woman that was injured after a car crash. Before joining our firm, Mr. Rubinowitz attended both Emory University and Brooklyn Law School. While at Emory University, Mr. Rubinowitz focused his education on forensic psychology. While completing his degree, he was a research assistant at Emory’s prestigious cognitive psychology lab and conducted studies that help psychologists better understand human reasoning. 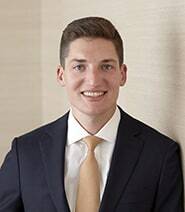 He was so inspired by his senior thesis research topic, “The Deficits of Eye Witness Testimony in the Court Room”, that Mr. Rubinowitz chose to continue his passion for legal education at Brooklyn Law School. While attending Brooklyn Law School Mr. Rubinowitz found his passion: providing justice for those in need. Following his time at BLS, Mr. Rubinowitz fostered these values by joining a law firm that protected recording artists’ intellectual property rights. Mr. Rubinowitz’s experience in intellectual property law brings a unique perspective to our firm, which has allowed him to excel in all the work he does on behalf of our clients. As a testament to his skill as a trial attorney, James was asked to lecture to third year law students at Cardozo Law School to demonstrate the intricacies of an opening statement in a Wrongful Death case. The lecture was part of Cardozo’s Intensive Trial Advocacy Program (ITAP), which teaches law students cutting-edge strategies for success in courtroom litigation (see video above).